Green beans mainly grow in Northern China. If every type of vegetable has its own personality, green bean must be the most difficult “person” to deal with, while mapo Szechuan tofu being the most easy-going one. Unlike bean sprouts, spinach or lettuce, very easy to cook, and good to be eaten raw or cooked, green beans need extra time or higher temperature to be well cooked. Undercooked green beans are said to contain toxins. 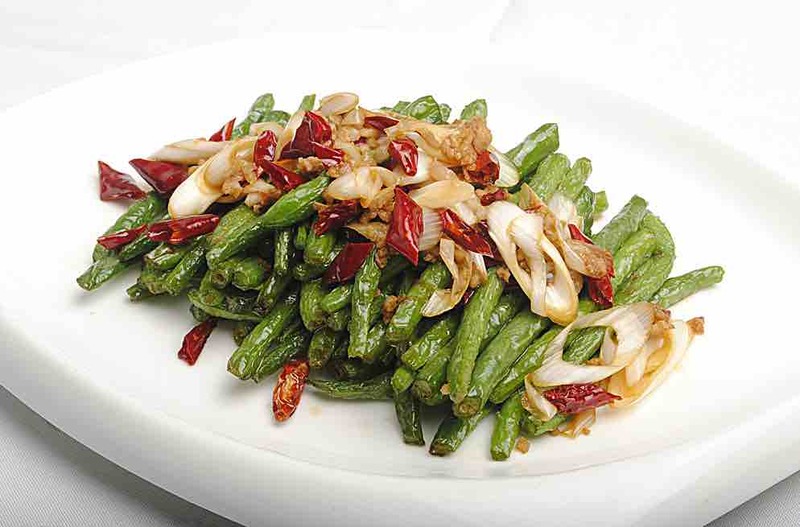 Today’s recipe Deep Fried Green Beans, an easy authentic Chinese cooking recipe, is just a good example. It’s the signature dish in Szechuan Cuisine, just like moo gai pan a typical Chinese food menu item in Cantonese cuisine. Green beans are rich in protein and amino acids. It can improve spleen and stomach function. Now summer is coming. Green beans refreshing taste can increase one’s appetite. Another great benefit is the anti-cancer effect. Green Beans seeds can activate the lymphocytes inside cancer patients’s body, therefore producing more immune antibodies, which can inhibit the growth of cancer cells. When you are ready to try this recipe, get ready to cook some rice as well, as they are best friends. In another words, you’ll want to eat more rice than usual because of the rich flavor in this dish. In China, we call this type of dish “Xia Fan Cai”, meaning “killing rice dish” literally. Now you get the idea, right? High temperature oil can make green bean shrink. It will looks ugly. Be prepared. I call it “tiger skin”. If you’ve read Tiger Skin Green Pepper (Pan-seared Green Chili Pepper) recipe, it’s not hard to tell what I meant here. Sorry if you find it confused. But that’s how Chinese people like to use their “imagination” in the culinary world. If you want to explore some new possibilities on top of this recipe, keep reading:) I highly recommend adding ground pork and black bean paste. Pork tastes better than chicken or beef in this recipe. That’s just my experience. You are free to try with any meat you like. Making Chinese food at home is fun and flexible. Once you get the hang of general cooking method, essential Chinese cooking ingredients and process, make the cooking experience as comfortably and personalized as possible. Ready for this “rice killer” recipe? Wash green beans and drain well. Heat 5 tablespoon oil in a pan over high heat. Add green beans. Deep fry until the skin gets a black wrinkle look. Transfer to a plate. Prepare the sauce: add chopped garlic, ginger, scallion, soy sauce, dried red pepper, soy sauce, salt, sugar and cooking wine to a small bowl. Mix well. Heat the remaining oil. Add the sauce prepared in step 4. Stir-fry for one minute. Add green beans and continue to stir-fry for one minute. Sprinkle some scallion on top.